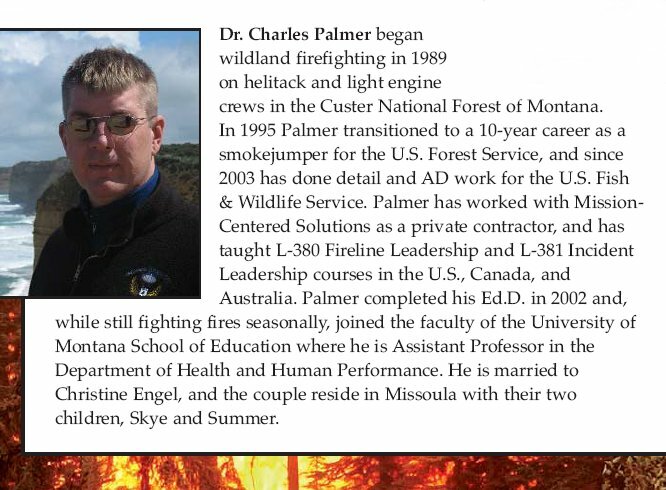 Dr. Charles Palmer began wildland firefighting in 1989 on helitack and light engine crews in the Custer National Forest of Montana. In 1995 Palmer transitioned to a 10-year career as a smokejumper for the U.S. Forest Service, and since 2003 has done detail and AD work for the U.S. Fish & Wildlife Service. Palmer has worked with Mission-Centered Solutions as a private contractor, and has taught L-380 Fireline Leadership and L-381 Incident Leadership courses in the U.S., Canada, and Australia. Palmer completed his Ed.D. in 2002 and, while still fighting fires seasonally, joined the faculty of the University of Montana School of Education where he is Assistant Professor in the Department of Health and Human Performance. He is married to Christine Engel, and the couple reside in Missoula with their two children, Skye and Summer. Wildland firefighting - A guide for crews, supervisors, and families. FIRED UP! The Optimal Performance Guide for Wildland Firefighters, by Charles Palmer, Ed.D., The University of Montana. Comprehensive, down-to-earth, informed by research and experience, this book is the first to show wildland firefighters how to do their best and be their best both on and off the fireline. Written by a firefighting veteran with advanced degrees in psychology and education, Fired Up! includes hundreds of tips and strategies for achieving peak performance physically, mentally, socially, and emotionally admidst the rigors, dangers, and stress of wildland firefighting.